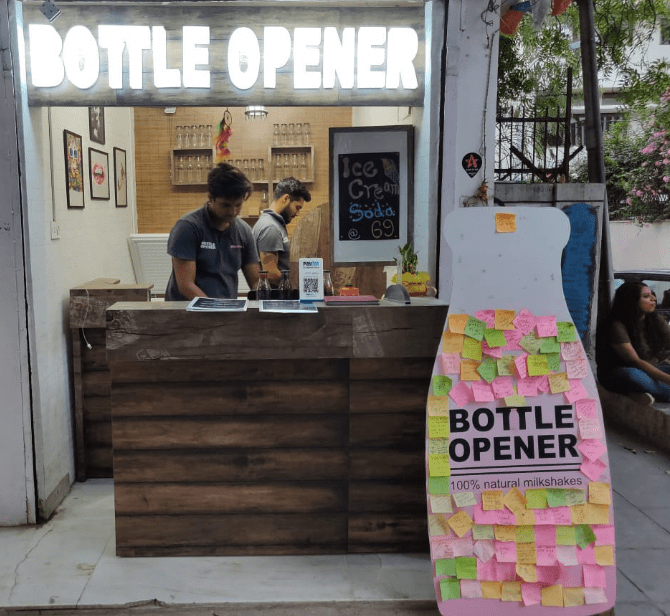 Bottle Opener is a beautiful little beverage shop that recently opened up right outside Jor bagh metro station, gate number 1. Started by a group of friends, Vishal Sethi, Saurabh Kumar and Sonali Paikaray from Air Force School, this entrepreneurial venture serves shakes and ice cream sodas in some really intriguing combination of flavours. In conversation with the friends we actually got to know a lot about them, “We are basically three school buddies & best of friends. We always wanted to do something on our own & something which we enjoy doing and not just for the sake of it. 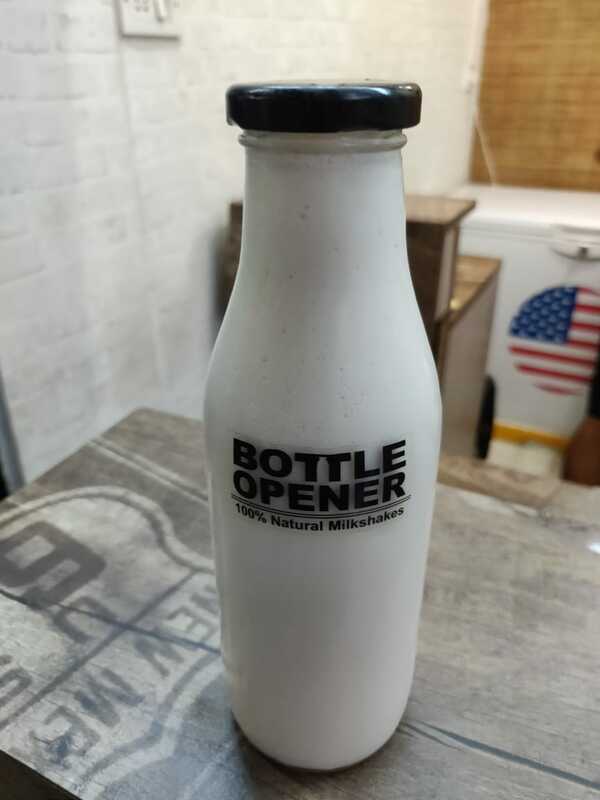 So, our friend and partner Vishal Sethi came up with this idea overnight and the very next day we started working on it & within a month this whole thing was conceptualised and implemented” said the Team of Bottle Opener. Their menu is divided into three categories. The “Killer Shakes” are for 139 rupees, the “Vintage Shakes” for 89 rupees and the “Ice Cream Sodas” for 69 rupees. Their whimsical and curious blend of flavours is their USP, and their menu is attractive to those who like to experiment. But it can also be intimidating for those who have somewhat conservative tastes. For instance, how many of us would ever have thought of putting popcorn and milkshake together? But that’s for later, first let’s discuss the aesthetics. With its charming and fanciful appearance, the cafe stands out amidst the string of plain old grocery shops in that line. There is also a beautiful graffiti on the side wall that portrays Lord Shiv in a meditative pose. 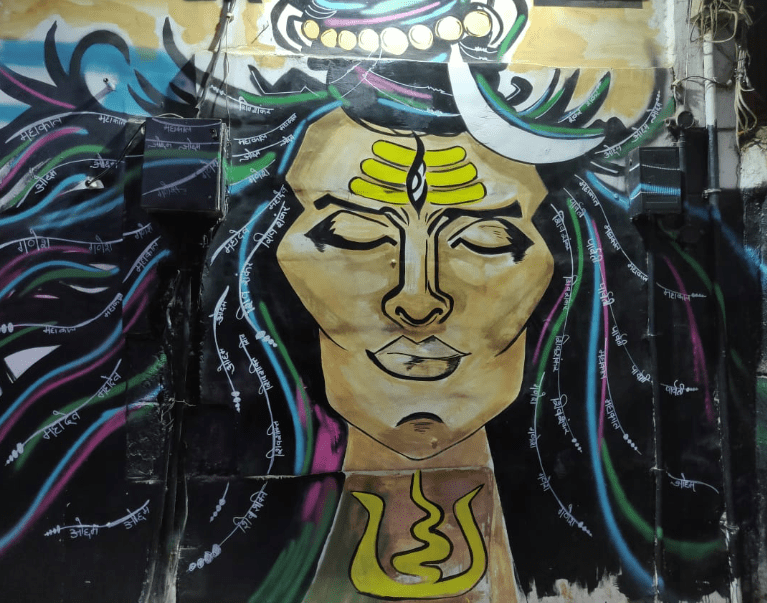 Full of vivid colours and a majestic theme, the graffiti was designed by one of the guys from the group itself and painted by Fitoor art studio. One downside though is that the shop doesn’t have a seating arrangement yet. The shakes come in transparent glass bottles. They are much more user friendly than plastic glasses as the glass bottles can be sealed with a lid in case you are not able to finish the heavy shakes in one go. And for someone like me who loves getting these cute little bottles for free, it’s a win-win situation. So, now coming to the main part i.e, the beverages being served. I was with a friend when we discovered the shop. With a lot of curiosity we had the Kokum Refresh and the Pink Guava in addition to the Black Currant Ice Cream Soda. The flavours are extremely unique and I cannot enunciate it enough. The innovative but smartly chosen combinations just blew my mind. For someone who usually only goes with traditional flavours and has very conservative taste buds, I was skeptical to begin with. I couldn’t understand how Kokum would go well with milk but once you have it, the taste somehow grows on you. And for people who love experimenting with tastes and flavours, it is a total paradise. Also, their flavours are very genuine and deliver exactly what they say. For example, if you take the Pink Guava, you get a very genuine taste of guava in the shake. There are also a few traditional variants on their menu like the oreo cookie crumble, brownie indulgence, mango duet etc. So if you’re not too keen on experimenting, you can always fall back on these classic alternatives. My friend accompanying me absolutely loved all three flavours right off the bat, while I needed a little more time to understand the flavours. The polarizing character of flavours is quite amusing, and one of the biggest reasons why one should try this place, to know which end of the dichotomy you fall into.